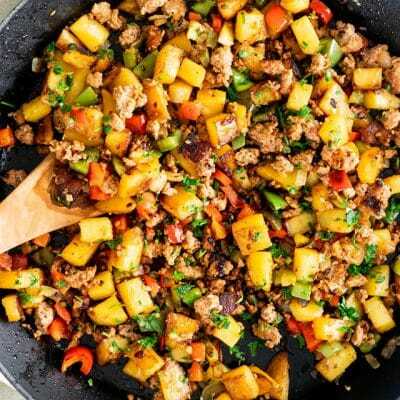 This Sausage Potato Hash recipe is perfect for breakfast or brunch! Served with fried eggs, it’s a hearty, comforting, delicious meal and super simple to make. This awesome recipe served with eggs is probably one of the most classic American breakfasts or brunch. It is also one of our favorite breakfasts and it’s so satisfying that you could just skip lunch. This is an ideal breakfast for a weekend when you have extra time in the morning. 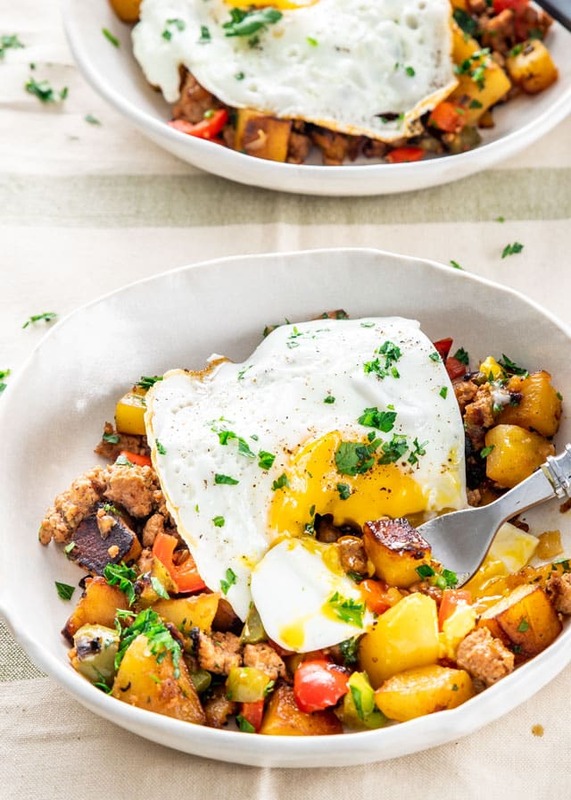 Although it’s a breakfast meal, I would honestly eat this potato hash for lunch or dinner, and I have, trust me. But weekend breakfasts are special and every weekend I try to make something delicious. 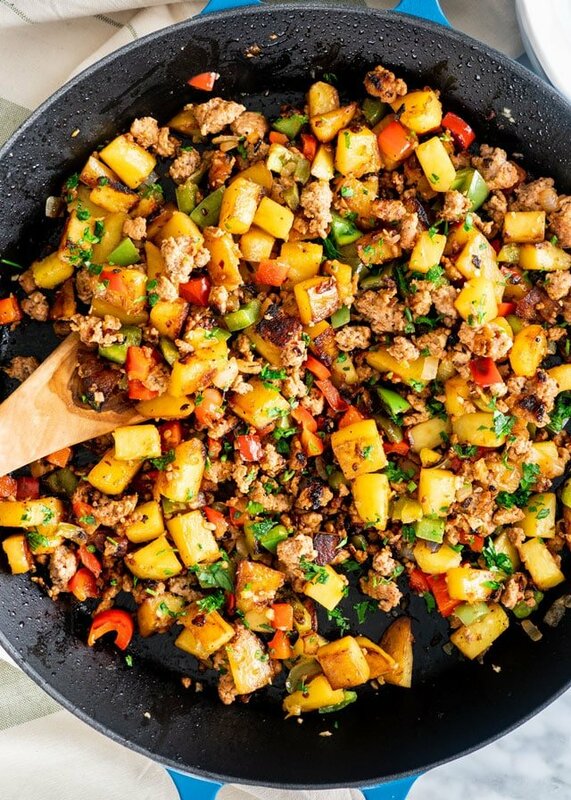 What Ingredients Do I Need to Make Sausage and Potato Hash? The great thing about potato hash is that it’s very versatile. You can make it with anything you want! Steak, chicken, ground meats, or make it meatless loaded with veggies. It’s totally up to you! Great additions would be asparagus, Brussels sprouts, corn, tomatoes, etc. Use your imagination; that’s what cooking is all about. We used Yukon Gold for this recipe, but it really is up to you. Try out russets, purple potatoes, red potatoes, sweet potatoes, or a mix to make everything nice and colorful! We kept the skin on for this recipe for that extra bit of crunch but you can, of course, peel your potatoes if you want. What Type of Sausage Should I Use? This recipe calls for Italian Sausage. I was just really craving some good herbaceous flavor in my hash! Other varieties you can try out are: chorizo, chicken and apple, smoked (andouille), beer brats, cheddar smokies, and linguica. If you use sausage that’s already cooked, cut it up into bite-sized pieces. Start by heating the oil in a large skillet over medium heat. Add the potatoes, and season them with salt and pepper. Stir occasionally and let them cook for about 7-10 minutes until they begin to soften. Add your chopped onion and let is cook down for a few minutes until translucent. Add the rest of the ingredients, and break up the sausage if it’s uncooked. Give everything a good stir and reduce the heat. Let everything cook for another 10 minutes or so until the potatoes are tender. You can cover the skillet to speed up this process. Adjust the seasoning, garnish with some parsley, and serve! I always serve mine with sunny side up fried eggs. It’s so delicious, and really turns this into a classic, hearty breakfast! I don’t know about you, but I love to keep my yolk a bit runny. There’s nothing like piercing it with your fork and watching the yolk coat the hash! Other than that, this recipe is loaded with veggies and meat so it is great to serve on its own. Store this recipe in an airtight container in the fridge for 3-4 days. You can reheat this in the microwave, but to keep its crispiness you can also reheat it with a little bit of oil in a skillet over medium heat. Can I Freeze Sausage and Potato Hash? If you choose to freeze this recipe, allow it to cool fully before placing it in an airtight container. It will last for 1-2 months. You can thaw this straight from the freezer in the microwave. If you want to reheat it in a skillet, allow it to thaw fully in the fridge first. Otherwise, you will end up breaking the potatoes and could end up with burnt pieces before the rest has thawed. Craving More Delicious Breakfasts? Try These! 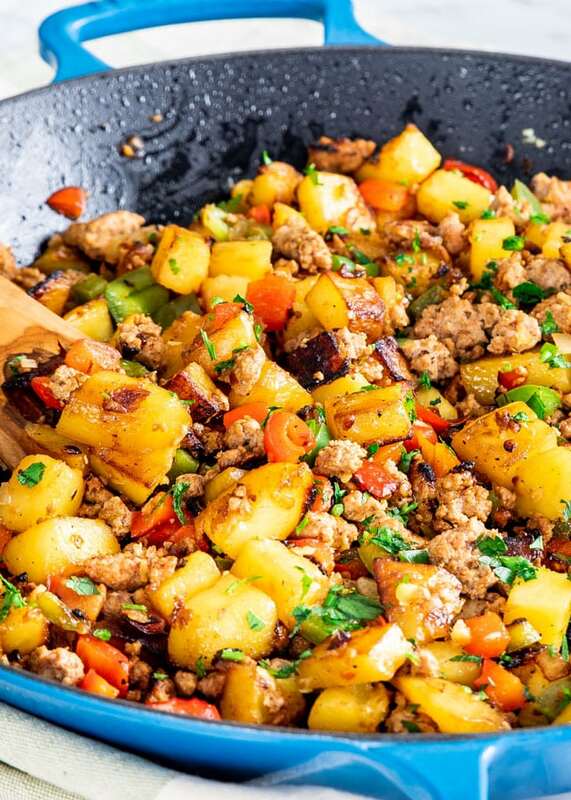 This Sausage Potato Hash recipe is perfect for breakfast or brunch! Served with fried eggs, it's a hearty, comforting, delicious meal and super simple to make. Add the olive oil to a large skillet and heat over medium heat. Add the cubed potatoes, season with salt and pepper and cook for 7 to 10 minutes, until they're about half way cooked through, stirring occasionally. Add the onion and cook for another 3 minutes, stirring occasionally. 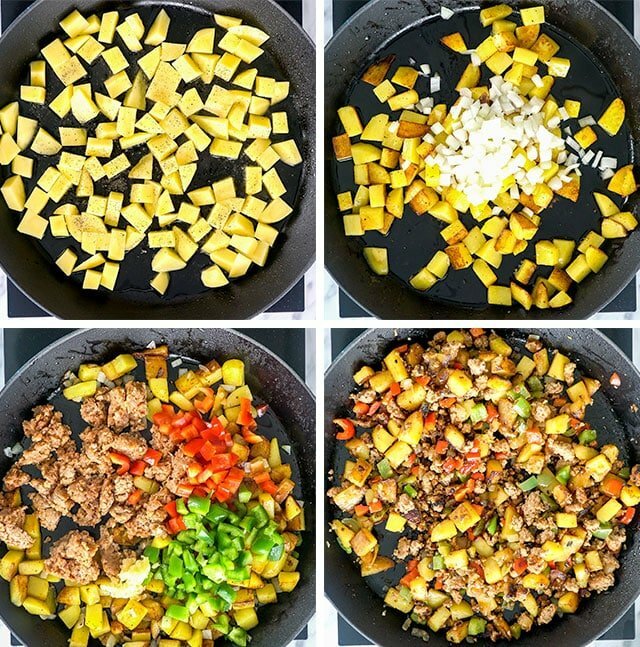 Add the sausage, bell peppers, garlic and red pepper flakes to the skillet and stir. Reduce the heat, and continue cooking until potatoes are cooked through, another 10 minutes. You can also cover the skillet, this will cook the potatoes a bit faster. Taste for seasoning and adjust with salt and pepper if needed. Serve with fried eggs. Sausage: I used a mild Italian sausage, but feel free to use a spicy sausage for more of a kick. Potatoes: I used Yukon Gold potatoes in this recipe, but you can also use russet potatoes. Recipe originally shared September 2012, updated with new pictures and video. thanx jo this sounds great – will try soon! I’ve made this a couple times recently with rave reviews from both kids and hubby (former chef). We love it! I just did up 5 lbs of potatoes, increasing the ratios to match – sort of – for a Men’s Breakfast. This was the hit of the buffet table… okay, it was the 2nd most favorite. Bacon always wins and there was none left. There was only about a cup of hash left when the dust settled and 24 men had been fed with bacon, sausage links, sausage gravy w/ biscuits, pancakes, scrambled eggs, this fabulous hash, fried potatoes and onions, toast, mixed fruit, coffee and orange juice. I wasn’t sure about the heat factor so I used Hungarian sweet paprika in place of the cayenne. Plus I used green, red, yellow and orange peppers. Very colorful. A couple of the men asked for the recipe to give to their spouses to make in the future. My wife and daughter-in-law were test tasters and they loved the hash. Oh, I used 3 lbs of regular breakfast sausage instead. This recipe will be used again and again in our house and when I need to “impress” for a buffet meal. Thanks. Are you cooking the sausage before adding to potato, or allowing it to cook in that stage? The sausage is raw when we add it, as you can see in the instructions and video we don’t cook it beforehand. This looks so good! Thanks for sharing this. Can’t wait to make it. I’ve never posted anything before, but I had to tell you, that I have tried many of recipes in the past few months and they have all been delicious. My husband and I just tried your “Baked Breakfst Taquitos” for breakfast this morning and they were wonderful. We haven’t tried this one yet, but plan to. Thanks for sharing. I LUV LUV YOUR SITE THANK YOU FOR ALL YOUR GREAT RECIPES!! What kind of sausage did you use in this?